We woke again to a beautiful day! Yet a bit warmer and overcast. Some did their own meditation or exercise practice, others slept in and those of us in the group who desired returned to our ancient chapel (St. Oran's chapel from the 11th century) for pranayama (breathing exercises), chanting and a reiki healing. We all convened at breakfast, full of energy, and Susan shared the word of the day which is JOY. Nourished by our breakfast, we set off into the day invited to notice when moments of joy crept into the day. The first bedrock we saw was almost 3 billion years old, Lewisian Gneiss, and, at the waters edge was a magnificent green and red. We were surprised to learn that the grey lichen covered rock was the same, simply not yet polished by the water. We walked around the point and saw some evidence that the earth may have entered a new age, the anthropocene. Further around, we were treated to slate bedrock which is among the newest on the island at a mere 800 million years old. We walked back among the sheep and made it back for us to find lunch in the town. All but one of us met at the Iona dock to take the afternoon boat ride to Staffa. The captain of the boat was very engaging as we made our way out. 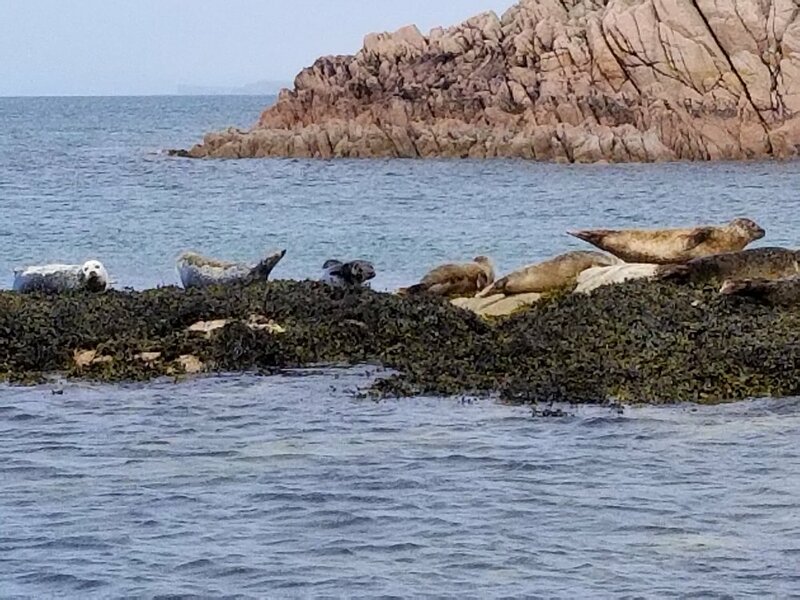 We saw many beautiful islands and passed by a group of captivating seals. The sky by now had cleared, thanks to the sun salutation team, but the waves were rather high, making the ride an adventure. We pulled up alongside Staffa, which itself is a geological marvel. Instructed by the captain, we made our way across the top of the island to a grassy edge and saw approximately 100 puffins well below us in the water. We sat and waited. And waited. My own body, which loves to move, was feeling enticed by the hiking trails around us but I sat and waited. Then, amazingly, two puffins popped out of a hole 3 feet away. Then more flew up and we were treated to the most magnificent display of puffin beauty. Absolutely mesmerizing. We forgot the time and had to jog back to make the boat. The ride back was delightful, those of us on the right side of the boat were washed with ocean spray. So refreshing!! We returned home in time space oddness, and gave ourselves far too little time to get ready for our gathering. I myself almost walked out of my room with my sweater inside out! It was a joy to gather and a joy to hear about other people's glimpses of joy in the day. In the evening, after another dinner feast, some of us experienced the peace of the Iona healing service. With us, I invite you to look for joy in your day.